And, as always, here are all of the flyers for Rich&apos;s upcoming gigs. 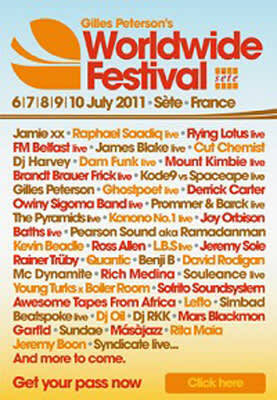 Rich is currently in France for the Gilles Peterson&apos;s Worldwide Festival; his show is Saturday, July 9. He will also do a set in Paris on Wednesday, July 13. For those of us trapped in the States, Rich&apos;s regular Wednesday show, minus him, though, will go down as usual at New York&apos;s Le Poisson Rouge (158 Bleecker St.). There will also be one more chance to catch Rich overseas; on July 18 he&apos;ll spin in Ghent, Belgium, during Gentse Feesten. When he returns to America, he&apos;ll heat up some wax at Beauty Bar Denver (608 East 13th Ave.) on Saturday, July 23. Finally, Rich will spin in Philadelphia at Fluid Nightclub (613 South 4th St.) on Friday, July 29.